Hungry City depicts a mountain like structure made entirely of cityscape and industry. The city is in motion on rollers with gaping jaws made of iron girders. Its purpose is to grow and thrive, devouring smaller cities and villages. Its ability to move has developed over time due to necessity as the surrounding villages, towns and cities are swallowed and depleted and therefore there is a need to look further afield for additional resources. The city is inhabitted - there are cars, roads, tiers consisting of houses, shops, a church, a financial quarter and a ´red-light´ district. The city is self-sufficient with an industrial quarter powering the structure forward. A class system exists as with any city where there are poorer areas and more affluent areas. The background depicts a derelict wasteland left behind after both natural resources and man made villages, towns and cities have been consumed. People have often asked me to explain how this idea came about ... it developed over many years and was a logical ´next step´ in my thinking about man´s greed for material wealth and his total disregard for his fellow man, the environment and the future of the world. 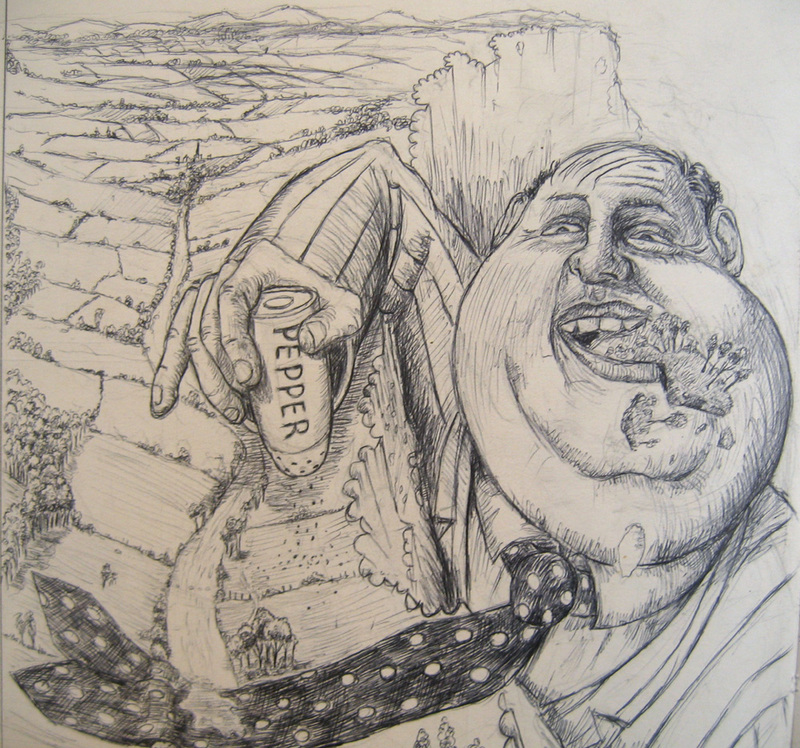 Hungry City was exhibited widely early 1996 and sold in galleries throughout London and Sheffield. It was also held with Bircham Image Library - an online reference library for illustrators and published in Artists Newsletter. 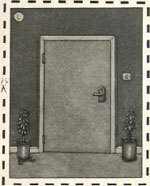 Its predecessor ´Capital Growth´ was published in Artist´s and Illustrators Magazine in 1995 and won several awards here, in the USA and in Taiwan. Their greed had no boundaries. Man would do anything to ´gain´ more of what he wanted. 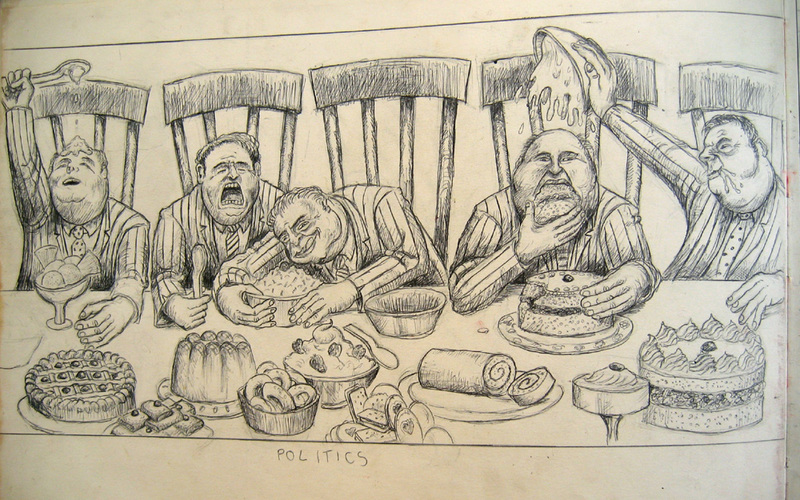 ´Politics´ this version is taken from my sketchbook. A coloured etching also exists. 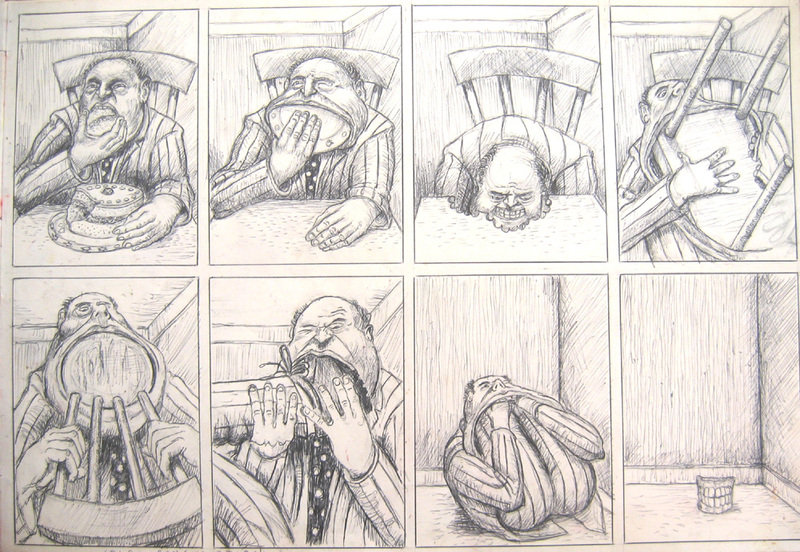 ´Self-Consumption´ Man will stop at nothing, devouring even the furniture and eventually ´himself´. 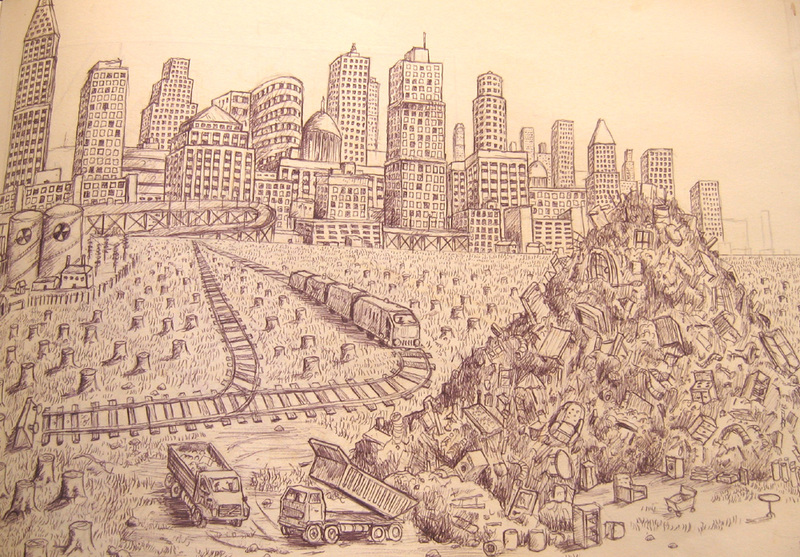 ´Fat of the Land´ Corporate wealth starts the process of originally ´city workers´ consuming all that surrounds. The price is nature, land, countryside, the earth. 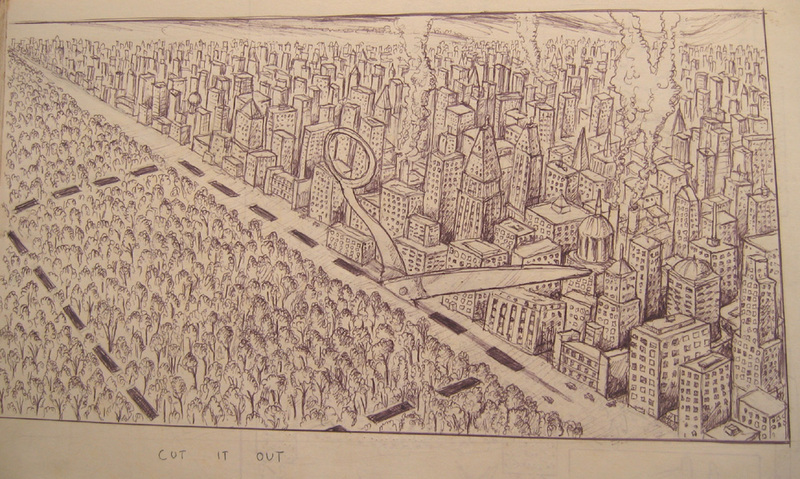 ´Cut it Out´ The city reaches its boundaries but needs more land. 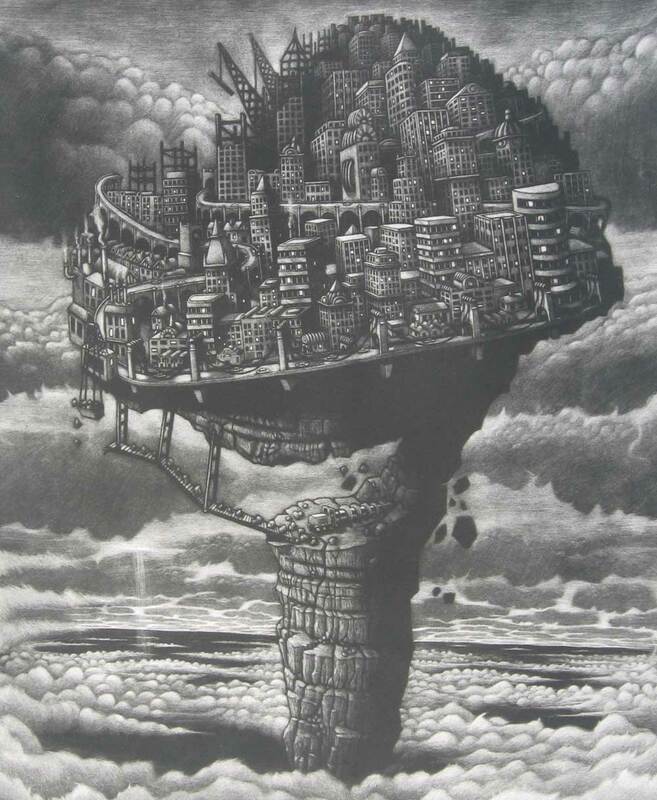 This led to one of my largest and most successful mezzotint prints (exhibited in the UK, USA and in Taiwan) ´Capital Growth´. 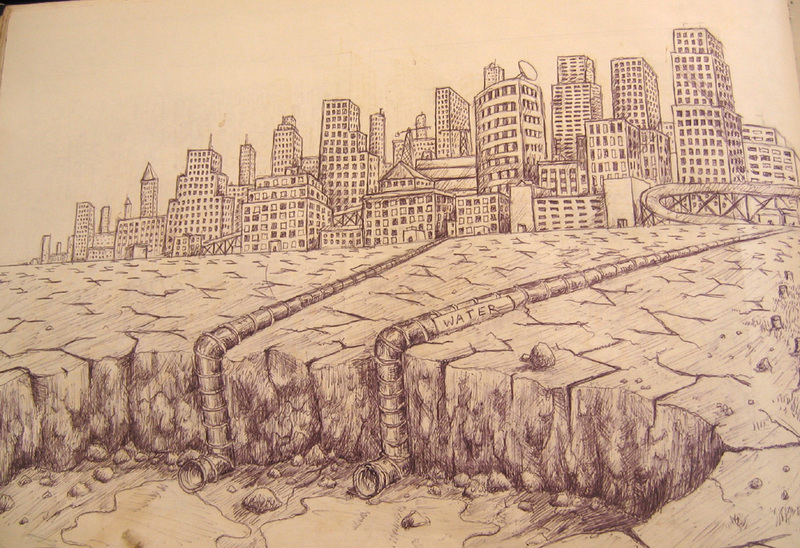 This print from 1995 came before ´Hungry City´ and depicts natural resources being depleted to a stage where the whole structure of the city is on the verge of collapse. Next came the idea that once a city had consumed all that was within it and all that surrounded it - it would need to find a means to ´channel´ resources from elsewhere. Once ´grabbing´ and ´channelling´ was no longer sufficient - next came the idea that the city just rises up, becomes mobile and ´moves-on´ in its need to find resources and to thrive. In that way, the city started to become a ´life-form´ in its own right. It became a ´Hungry City´ searching and devouring. Visit the ´Environment´ gallery for more.